Mack, Yo-yo and Flint deal with the roaches on the human inhabited floors and possibly unite the humans with rousing speeches. Time either is or isn't a closed loop. Avuncular Voss turns on the time travelers in the hopes of taking out Quake before she can go back to the past, but only succeeds in killing Robin (also Deke's dad previously). Robin gets in a last word with May, giving her the clue to fixing the monoloith. A.V. 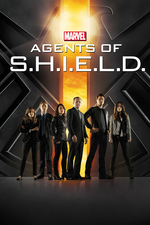 Club: Time travel musings muddy an overstuffed Agents Of S.H.I.E.L.D.